Driving along the dales, I could see the scenes which seem to appear in the picture books for children one after another. 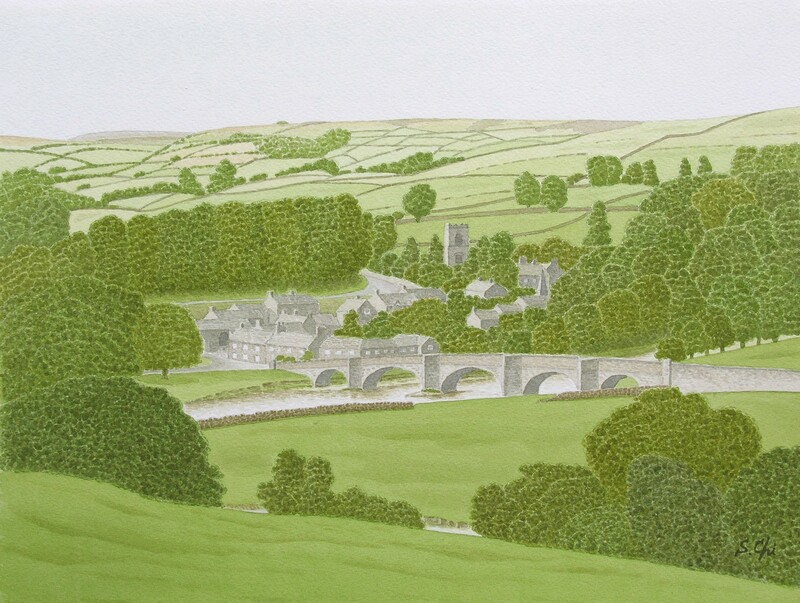 Going up from Appletreewick, soon, I could see alarge stone bridge across the River Wharfe and a beautiful village over it. The village was Burnsall, which is said to be one of the most beautiful village in Wharfedale and is often taken photographs. Burnsall is a village having an old history and it is said that the eary Saxons and the Norse, the Vikings, settled here. A font and grave stones of the Norse remain in the church which was built in the 12th century. The large and magnificent stone bridge of Burnsall with five large beautiful arches, was constructed in 1612 by Sir William Craven who made a success of life. An event called Burnsall Feast Sports, having a long history dating back to the age of Elizabeth I, is held in August. The Fell Race, a race of running around the hills, is very popular and many runners take part in it. When I was watching the cinema "Calendar Girls", I noticed the scenes of the summer festival of this district were taken in the green near the bridge. In the cinema, I saw many beautiful landscapes of the Yorkshire Dales, and they reminded me of my old days when I had driven there.